Make life a little lovelier with this unique rose design! 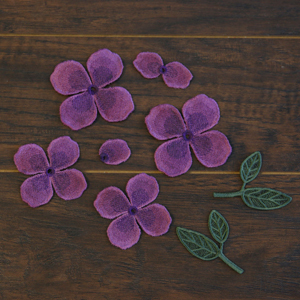 Stitch freestanding petals on water-soluble stabilizer, then rinse to leave only the thread, and construct your flower. Soft shading brings beautiful depth and dimension to this design! Begin by stitching eight pieces of freestanding lace onto heavy duty water-soluble stabilizer using 40 wt. rayon thread for best results. 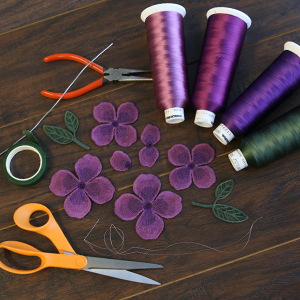 Make sure to sew two of each of the four petal pieces (labeled with "a" and "b"). Once you're done stitching, rinse and dry each piece completely. (Here's more on stitching freestanding lace). The rose will be assembled on a piece of wire. 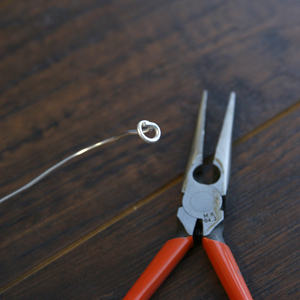 Cut a piece of 12 gauge floral wire to 10" in length using a wire cutter, and curl the end with a needle nose pliers. First, take the single petal piece (labeled with a "d"). 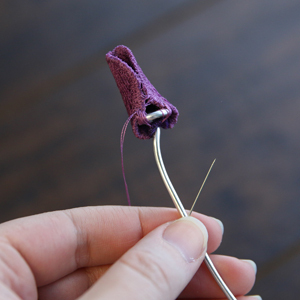 Slide the wire through the sewn eyelet, and make sure the curl ends up resting against the wrong side of the lace. Fold the petal with wrong sides together, and line up the opposite edges. 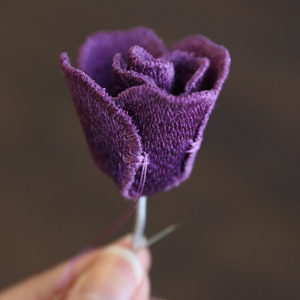 Using a hand sewing needle, sew the edges together about 1/2" from the bottom of the petal. 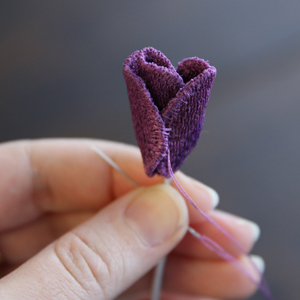 Then sew the petal onto the wire loop. Next, add the two petal piece (labeled with a "c") onto the wire, making sure the wrong side of the lace is resting against the first piece. 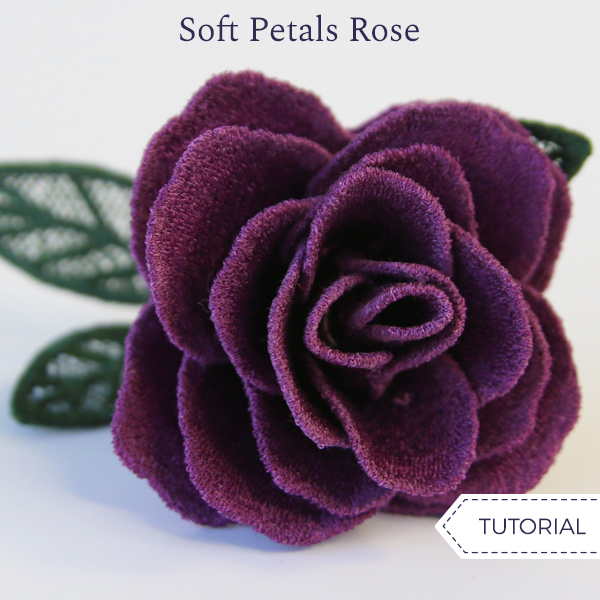 Use a hand sewing needle to sew the two petal piece to the single petal piece. This will keep the petals from falling off of the wire or spinning. 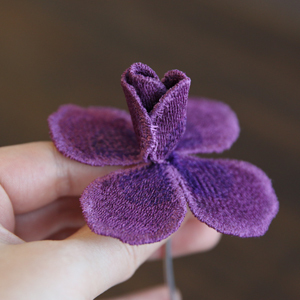 After they are attached, fold the two petals up around the first lace piece. Overlap the petals slightly, and hand sew them together where they overlap. Now add the first of the smaller, four petal pieces (labeled with a "b"). Make sure the wrong side of the lace piece is resting against the previously added pieces. Hand stitch the new four petal piece to the two petal piece. 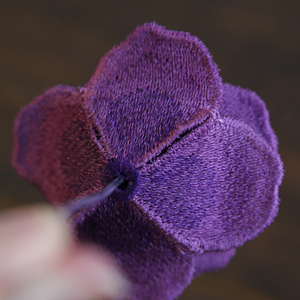 Fold up the petals, and overlap them about 3/8"- 1/2", and hand sew then together where they overlap. 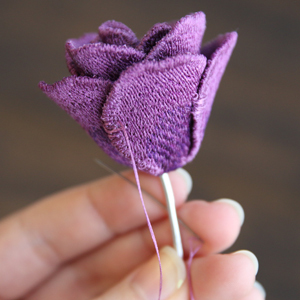 Then repeat to add the second small, four petal piece ("b"), and sew it to the previously added petals. This time overlap the petals by 3/8", and hand sew them together where they overlap. 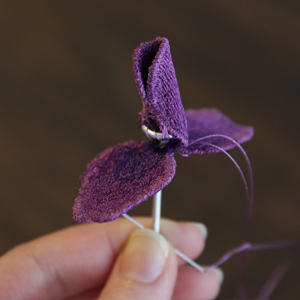 Next, add the first large, four petal piece (labeled with an "a"), and sew it onto the attached petals. 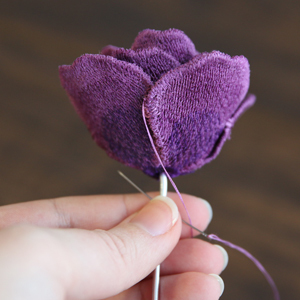 Fold up the petals, and overlap them by 1/4", and hand sew them together where they overlap. Finally, add the final petal piece, and hand sew it to the other petal pieces. Fold the petals up, but this time, do not overlap them. 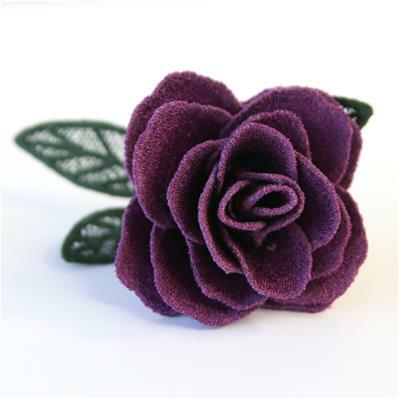 Instead, hand sew them together side by side with just the edges of each petal touching. 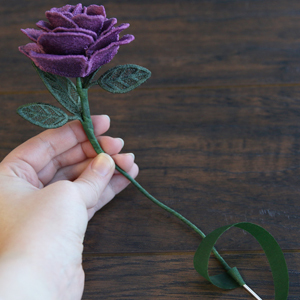 Using floral tape, begin to wrap the wire stem. Take the two lace leaf pieces (labeled with "e" and "f"), and add them to the stem as you go, wrapping their stems with the floral tape to hold them onto the wire. Your rose is complete! 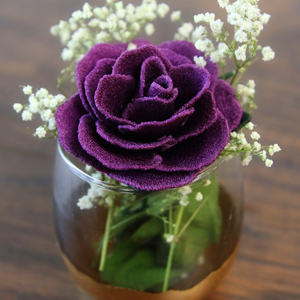 Craft these unique flowers for those you love, and let beauty bloom all around you!